Lights, Camera, Action…now starring in Hollywood is Hello Kitty! Just recently it was announced that New Line Cinema, Sanrio and FlynnPictureCo. are working together for the first ever feature film that will star our favorite girl; Hello Kitty! Hello Kitty is definitely ready for her close up but before the movie hits the big screens; Kitty White is already hitting Hollywood via the newest Sanrio Corporate Store in Hollywood and Highland! Walking in; one of the first things one notices is an amazing gigantic Hello Kitty Pez on display. If it looks familiar that is because it is was a part of the film Ant-Man and the Wasp! (Yes it’s that flying pez that was saw in the middle of the movie!). Right next to the Hello Kitty Pez is the ever so cute Hello Kitty on a plane. She is definitely flying to new heights in this store. Also on display is a large Hello Kitty figure that was once part of the original Sanrio Corporate store in San Francisco! I was so happy to see this display now making its appearance in So Cal! Hello Kitty Hollywood has lots of unique offerings but perhaps one of the most special ones is a the small pop-up that they have featuring Japangeles. The Hello Kitty x Japangeles collection can only be found at the Sanrio Corporate store in Hollywood! There will definitely be more featured collaborations hitting up the store in the near future! Hello Kitty is definitely ready for her close up! Come on over and say hello to the newest big star to hit Hollywood. 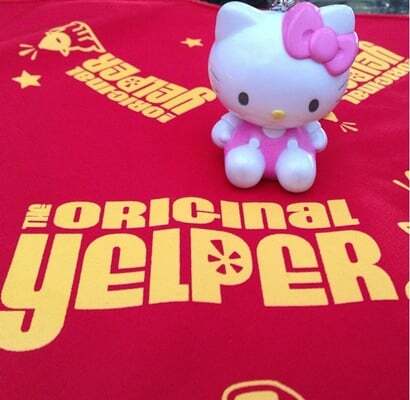 For more smiles; please see my Yelp review on Hello Kitty Hollywood. Hello 12 Days of Sanrio Christmas! my true love sent to me a Hello Kitty Barbie! and a Hello Kitty Barbie! 6 “Eggsistential thoughts” by Gudetama! Along with the recent opening of the Hello Kitty Pop-Up Cafe last month in Irvine Spectrum, there was another sweet surprise that came our way! Similar to the Hello Kitty Pop-Up Cafe, this surprise was cute, pink and hello kitty happy! That sweet surprise was no other than the launch of the Hello Kitty Strawberry Surprise cookie mix. Betty Crocker and Sanrio have come together to offer this cute ready-to-bake cookie mix topped with an edible Hello Kitty image. I recently purchased this cookie mix and had a lot of fun baking with hello kitty! All that is needed is 1/3 cup vegetable oil, 1 tablespoon of water and 1 egg. It is so fun watching the cookie mix, oil, water and egg mix together because the dough starts turning pink! Once the dough is ready, the next fun part was shaping the dough and placing the hello kitty edible images on the dough. After baking for about 12 minutes at 350 F, the result was cutest pink cookies ever! I was really pleased with how easy it was to make these cookies and I was in heaven with the result. The sweet aroma of these cookies filled my kitchen. Once the cookies were ready to eat, I found them to be very delicious. They were not just plain sugar cookies, the strawberry taste was distinct. It was definitely a strawberry surprise at first bite! For anyone who loves to bake and a hello kitty fan, these cookies are just for you! Hello Kitty and cookies are the perfect combination. The new cookie mix is currently available at grocery stores and mass retailers throughout the United States.